The front of their shirt (for now) is emblazoned with the letters spelling out UNICEF. And honestly speaking, that is the last thing I like about Barca. They are famed for playing passing football, but recently against Real Madrid, of the 600 passes 300 were sideways or backwards. They are capable of playing extravagant football, but more and more they seem to avoid it. Cruyff’s Barcelona played total football, they were widely respected and seen as the best team on the planet. This Barcelona might when more trophies, but they have not one my respect with a few others too. Read here for Jon Nicholson’s post on F365. Lets start with the three reasons I dislike Barcelona. In Barcelona’s shameful attempt to lure Cesc Fabregas to the Nou Camp, Barca employed every single player to publicly say something about Fabregas. 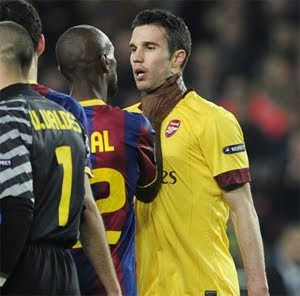 They had Laporta and co say that Arsenal are keeping Cesc as a slave. Xavi said over and over again that we were keeping Cesc against his will. If you want a player, pay for him. Barca over Arsenal less than they paid for reserve team player Mascherano. Another player that they publicly tapped up. What bugs me is that they are protected about this and not reprimanded by Fifa. They moan about Arsenal signing youth players completely legally when they have publicly tapped up Henry, Hleb, Cesc and Petit back in the day. Don’t get me wrong, when they do turn it on, it is the beautiful game and in Lionel Messi they have the best player on the planet. He alone is worth watching, but the culture of Barcelona is one that I can not support. So come Saturday night, for the first time in a very long time, will I shout for Man United. Lets hope they do it with a ridiculous penalty and an offside goal. Alongside Vidic punching Biscuits in the face for no one to see. Well you can always wish cant you.